1. Miami at Philadelphia (-6.0) — The Dolphins have faded since their little two-game run after Dan Campbell took over as interim head coach. The Eagles are playing better and are beginning what happens to be the easiest remaining schedule in the NFC East. 2. Minnesota (+3.0) at Oakland — The Vikings have played well lately. 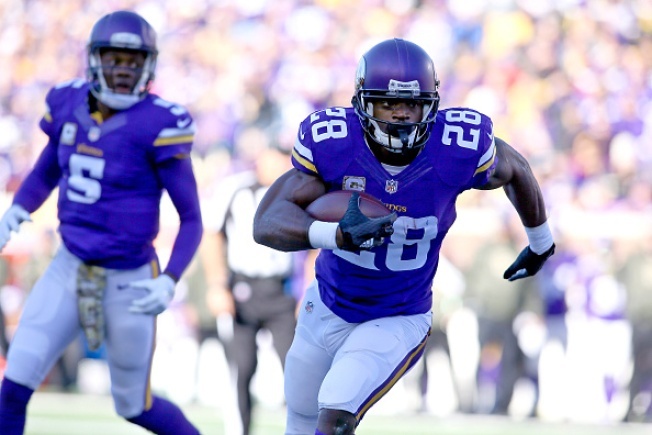 Adrian Peterson is the league's leading rusher in the year of running back injuries, and their defense has been opportunistic and respectable. The Raiders are also playing well, but for some reason, i don't see this one going their way. 3. Kansas City (+5.5) at Denver — The Broncos' defense is phenomenal. We know that. The Chiefs' offense is not. We know that, as well. But the Chiefs' defense is pretty good, and the Broncos' is fairly pedestrian. Not to mention, these teams usually play close games as fierce divisional rivals. 4. New England at New York Giants (+7.5) — The Patriots will improve to 9-0 on the season on Sunday afternoon — I'm not going that far — but it's going to be closer than we all might think. The Giants are playing well, and if you remember, the Giants have always kind of had Tom Brady & Co.'s number. 5. Dallas (+1.0) at Tampa Bay — If there was ever a put-up or shut-up game for Dallas, this is it. If they can't win this game, they might not win another one. All but one of their losses in this six-game skid have been so close and so winnable, and while the Bucs have shown some life, they're still a young team and have a rookie quarterback. Last week: 2-3. 2015 season:23-21-1.